9th PDC taught on Oahu since 2012! This year's extended Permaculture Design Certificate course will take place over 6 months. It's the most flexible and convenient PDC format for those with busy schedules. Occurring every 4th weekend, from January through June in a different part of the island of Oahu. Over the duration of the course we will visit sites in each of the 6 moku (traditional land divisions larger than ahupua`a), so that we can fully appreciate the diversity of climates on the island. Coursework is mixture of classroom-style and hands-on practicums. Site visits to local organic farms, arboretums, agricultural research facilities, and sustainability learning centers are a valuable part of the experience. Successful graduates will receive a Certificate in Permaculture Design. The course fee is $1000. Take advantage of early bird discount: If you register and deposit by December 15, tuition is only $900. $300 non-refundable deposit required to hold your space. Balance due by first day of class. Group, education, and other discounts available, email Donna Lay (DonnaRLay@gmail.com) with questions. Your Instructors -- scroll down past testimonials for some great videos! Hunter Heaivilin holds degrees in Tropical Forest Ecosystem and Agroforestry Management as well as Sustainable Community Development. His educational and consulting work has taken him to projects throughout the Pacific, Caribbean, Southeast Asia, and the Andes. From disaster response, to agroecology and waste management, his experience across the globe has informed his work back at home in the islands, where he is, among other things, currently the Coordinator for the Oahu Farm to School Network. Matthew Lynch is the System Sustainability Coordinator for the ten campuses of the University of Hawaii. 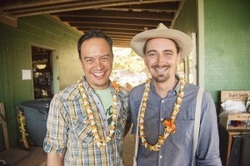 He is also founder of of the Honolulu based nonprofit Asia-Pacific Center for Regenerative Design, and currently serves on the Board of Directors for Kahumana Organic Farm and Slow Food Oahu, and as the Measures Project Co-Chair for the Hawaii Green Growth Aloha+ Sustainability Dashboard. Matt's talent for energizing communities and individuals has re-humanized urban and institutional systems in the developing and developed worlds, and works towards restoring & regenerating the ecological systems upon which these social systems depend.